Copywriter | Portfolio | Copywriting Award . WHAT AWARD? WHAT DOES IT MEAN? The World Communication Awards (WCAs) are presented in London every October and are the "Oscars" of the telecommunications world. In order to be considered for an award category, companies from around the world have to submit written pieces arguing their case. Entries are under word limits, so have to be extremely tightly written. I wrote the entries for 2002, the year NTT Communications won its first-ever Awards (in fact, the first Awards won by any Japanese company). The WCAs are judged in London; at the time I was working in Tokyo. Not great for liaising with the NTT Communications UK office (there's an eight-hour time difference at the time of year I was working), but perfect for me to be able to get access to the engineers and technicians in Tokyo. After meeting with colleagues in Tokyo and getting the agreement of staff in London, I decided which projects would be suitable for us. We thought it would be most effective to focus our efforts on the "Best Technology Foresight" and "Best Carrier, Asia-Pacific" awards. For the Technology Foresight project we decided to talk about NTT Com's work on IPv6, the next-generation Internet protocol, and its advantages over the incumbent technology, IPv4, in terms of address space, quality of service and security. I met with engineers and synthesised the information they gave me (in English and Japanese) into word-limited entries. There was a lot of technical information to include in the "Long" (500 word) and "Short" (250 word) pieces, while at the same time I wanted to make the entries readable and interesting. The Asia-Pacific Carrier entry was considerably easier to write! I had access to lots of juicy information about what NTT Com had been doing in the region over the last year, the new and innovative services it was offering and the development work it had pioneered. The most difficult part of writing the 500-word and 250-word entries was deciding what to leave out; it would have been easier to write 10,000 words on the company's projects (the Blaise Pascal quote is relevant here: "I would have written a shorter letter, but I did not have the time." It's often easier to write "long" than to write "short"). Once I'd cleared all entries with the concerned parties (technical, PR and managerial staff at NTT Com in Tokyo, marketing staff in London), I sent them off to be judged. And hey presto. NTT Com's first-ever global awards. CEOs and Managing Directors of telecommunications companies to gain industry-level credibility. 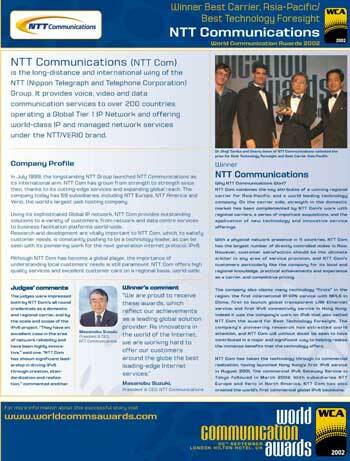 IT managers and decision-makers of multinational companies around the world to give NTT Com greater recognition. Whenever I read that such-and-such an agency has won an award for its latest ad campaign, I always think "That's nice for them... but what does it mean to the customer employing them?" This is what the two WCAs meant for NTT Communications: it gave them credibility. On several occasions, unprompted, NTT Com salespeople thanked me for making their job easier. Their target customers had noted the awards and were receptive to NTT Com's overtures, which had a direct effect on the success of NTT Com's sales. After a gap of writing WCA entries, I wrote for Baltic Data Center in 2008 and had their entry on Project Management shortlisted for an award. There are lots of industry award ceremonies -- not just in telecoms -- and they aren't simply exercises in vanity; being shortlisted and winning awards can give your organisation a boost in credibility and recognition out of all proportion to the money you invest in preparing your entries. I can write competition entries for you. I'm flexible, easy to work with and am happy to work to deadlines (for the 2002 WCA entries I eventually switched my computer off at 5:30am, Tokyo time, on the day I sent them). Drop me a line to get started.